PETA Protest Against Manila Zoo! Yes! This is happening now as I'm writing this article. Bring: Just yourselves! Signs and leaflets will be provided. Please feel free to bring friends, family, or anyone else you think would like to attend. If you're not able to make it to the protest, but would like to speak up for the animals at the Manila Zoo, please add your name to the ever-growing list of people who want to see the zoo stop taking in animals and ultimately closed using this form. 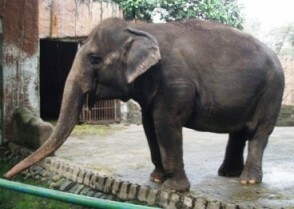 The Manila Zoo has been internationally criticized for housing animals in cramped, barren cages and for providing substandard care. The animals are relegated to a lifetime of boredom and abuse, which often leads to self-mutilation and other abnormal behavior. As do all zoos, the Manila Zoo presents visitors with a distorted view of wildlife. In the wild, most animals roam territories of hundreds of kilometers, but the entire Manila Zoo measures only 0.055 square kilometers. Even the largest zoos worry that they cannot provide the space, exercise, privacy, and mental stimulation that their animals need, much less fulfill their other complex needs. If you have any questions, please contact my dear friend, Rochelle, PETA Philippines President on (02) 817-5292 or at RochelleR@PETAAsiaPacific.com or text PETA Philippines hotline on 0920-497-4679.